Yesterday I was talking to another parent who just left Austen and Peyton's Montessori school because they had to move. Her daughter was in Peyton's class and she was sharing with me how when her daughter entered her new (non-Montessori) school they asked her if she was using a sippy cup because she hadn't brought one. They probably didn't realize that in Montessori, you don't ever utter the words sippy cup. They learn to drink from little cups around the age of 1 and start to perfect it close to 18 months. Peyton is doing great with the cup! So yes, at home, she would use some sippy cups because while she was perfecting her technique, I didn't want it all over my floor all the time. But now at almost 21 months, I think it's time to start phasing out the sippy cup. Montessori also pushes the potty training from a young age. I think Peyton's ready. It's just am I ready? It was relatively painless with Austen because he was great at holding it and didn't ask to see every bathroom every time we went out. Peyton will tell me now, "Pee Pee!" and I will take her to the bathroom and she will sit there and 5 seconds letter proclaim "All done!" although she didn't do anything. So we are gearing up for that soon. Austen was potty trained at 25 months. Maybe Peyton will break one of Austen's records. One thing that I also like that Montessori does at this age is teach practical life skills. Peyton is pretty good at using utensils when eating. She also tries to put on her coat and backpack herself. And, just today, I witnessed her put her shoes on her feet twice! She has also finally started saying her name. So next time you see her, you can ask her and she'll tell you! We knew our days were numbered with Austen taking a nap probably since Spring. Since that time we've either battled with Austen to take a nap or to actually go to bed. When he did nap, he was having a rough time going to bed and it would take him 1-2 hours before he actually fell asleep depending on the night. I broached this with his teacher at school and she told me he was having no trouble napping at school. Suspect in my opinion but that's a whole different story. Lucky for us, she left the school and when the new year started Austen had a new teacher. I took the opportunity to ask her if Austen could stop napping altogether. Now when a parent asks this I understand that it is a serious consideration especially when they are close to age 5. This is because those who don't nap around age 5 actually participate in advanced lessons during this time. Austen was so excited to participate. Well, the first day he lied and told me he napped because he wanted to stay up late but his teacher emailed me that evening so I knew he was participating. Anyway, since day two, Austen just seems like a sponge soaking up the advanced lessons and has proudly declared his two new best friends in his class, ones he does advanced lessons with. He also proudly shares with us the work that he has done in advanced lessons that day. A lot of it is practicing numbers and penmanship to ready them for kindergarten/first grade. I'm excited about that. But I'm even more excited now that he's asleep within five minutes of me putting him to bed! 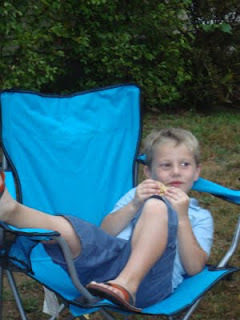 Yum, I can eat ice cream cones pretty well now and I better have one if Austen is having one! Happy and eating S'Mores. 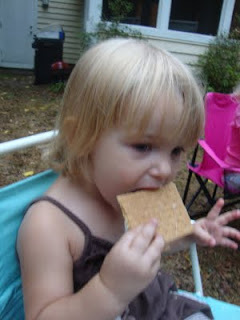 Peyton enjoyed her first S'More experience even though she wasn't allowed to roast a marshmallow. On an almost fall-like day, Austen enjoyed flying a kite. His first time doing so. He enjoyed it! Hard at work building with Dad! Stealing Mom's seat and her Us Magazine! 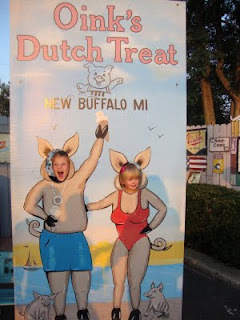 Michigan is always a good time. Hopefully one day we'll have a house of our own up there. That's the plan anyway! Peyton has the biggest sweet tooth. I'm sure my family would say that she takes after me, however, they might be unaware that my husband loves sweets even more than I do. Peyton definitely takes after him. Never mind eating her dinner, she wants dessert even if she doesn't eat all of her vegetables! Try reasoning with an almost 20 month old. Do you want dessert? Yes, she'll shake her head. Then eat your green beans! No, she shakes her head. And this child certainly thinks she's entitled to dessert without eating her dinner too. Good luck to her on that one. Here's a night where she actually did eat her dinner and shows her sweet eating prowess just like her dad!